Do you know the symptoms of Low T? Sometimes when symptoms, such as ED, low energy or inability to lose weight occur together, they may all be linked to a drop in hormone production, resulting in Low Testosterone. Not sure? Take Our Quiz or schedule a free phone consultation. Treatment is available–watch our videos below for more information. Low Testosterone occurs when there’s a hormone reduction in the body and although generally related to aging, it can occur in younger men in their 30’s or 40’s as well. Accurately diagnosing Low T must always include a thorough examination of symptoms and complete blood work-up from a reputable lab. If you think you might be suffering from Low T but aren’t quite sure, we recommend taking the Aging Male Symptoms (AMS) Questionnaire. 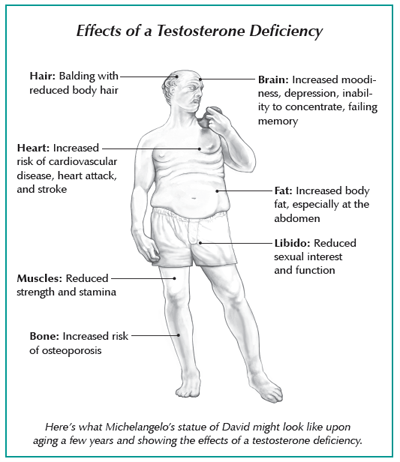 Take a look at this illustration of what Michelangelo’s statue of David may have looked like if he was experiencing Low T. If any of these symptoms sound all too familiar, contact us to schedule a free phone consultation or an appointment. Low Testosterone is primarily treated with Testosterone Replacement Therapy (TRT), which in recent studies has shown to decrease the incidence of cardiovascular outcomes, such as heart attack or stroke, by 30%. Contrary to what you may have seen in the media, the preponderance of medical evidence clearly shows that treating Low T with TRT does NOT increase your risk of prostate cancer or cardiovascular disease. In fact, studies correlate TRT with improved cardiovascular and overall health5. Click here to learn more about treatment options. Call us at 646-380-2600 or complete the form below for more information or to schedule a free phone consultation or an appointment. Dr. Werner discusses the benefits of the Testosterone Replacement Therapy (TRT). Dr. Werner is professional, courteous, trustworthy, personable and compassionate. For the first time in my life, my Low Testosterone condition is being properly managed and I have never felt better. Receive treatment uniquely attuned to your needs. Here, we treat the whole person.